Brad Cole is a friend of mine who runs a ministry called Heavenly Sanctuary. This ministry puts on Conferences around the country on the Character of God -- and they get it right. This year they hired an artist named Lars Justinen from the Justinen Creative Group to paint the above picture to use on posters advertising their conference. Under this picture they had captions like "Follow the Leader," "God IS Great," and most accurately, "Jesus - Still Too Radical?" Heavenly Sanctuary had contracts with several malls in the Seattle area to hang these posters advertising their conference, but no sooner had the posters gone up than angry calls began flooding the malls. 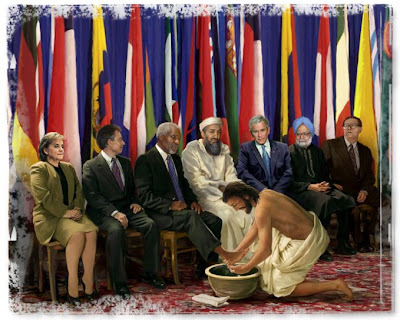 Many people -- but, it seems, mostly Christians -- were offended at the image of Jesus washing Osama Bin Laden’s feet. There was such an outcry that each of the malls decided to go back on their contract and take the posters down. The Christian College that Heavenly Sanctuary was renting space from to host the Conference also canceled their contract. Brad had to scramble to find a secular venue (which, ironically, had no problems with the poster). What does this say about how many American Christians envision Jesus? Obviously, the protesters believe that Jesus would not wash Osama Bin Laden’s feet. But Jesus died "not only for our sins, but for the sins of the whole world" (I Jn 2:2) -- and this obviously includes Osama. So if Jesus died for Osama, how are we to imagine him being unwilling to wash his feet? What the protest reveals is that many Christians have tragically allowed their patriotism to co-opt their faith. They have allowed their American citizenship to take priority over their Kingdom citizenship -- despite the New Testament's instruction for disciples to consider themselves "foreigners" and "exiles" wherever they happen to live (Heb. 11:13; I Pet 1:17, 2:11) and to consider their real citizenship "in heaven" (Phil 3:20). Many American Christians seem to want a Jesus who will defend their country and hate their national enemies as much as they do. Many want the Jesus of the Middle Ages whom Crusaders called on to help them slaughter -- not serve -- their Islamic enemies. Many seem to want to reduce Jesus to just another version of the tribal gods that have been called on for centuries to bless tribal battles. Most wars throughout history have been fought under the banner of some god or another. Fortunately, the real Jesus isn't anything like this. Knowing all power had been given to him, John says, he wrapped a towel around his waist and washed the dirty, smelly feet of people he knew would deny and betray him in a couple hours (Jn 13:3-5). Knowing he could call legions of angels to vanquish his foes, the real Jesus rather chose to let them crucify him, because this is what they needed him to do (though they of course didn't know it). Then, with his last breath, the real Jesus prays to his Father to forgive his barbaric torturers -- and all of us (Lk 23:34). This is the kind of power the omnipotent God of the universe uses against his enemies. And this is the kind of power we're to use against our "enemies." It's the power of Calvary-like love. We're called to imitate the Jesus who washes the feet of enemies, dies for them, and prays for their forgiveness. We are to "live in love, as Christ loved us and gave his life for us..." (Eph. 5:1-2). When we were enemies, Jesus nevertheless ascribed unsurpassable worth to us by paying an unsurpassable price for us. We who claim we are his disciples are called to do the same. We're to sacrificially ascribe unsurpassable worth to all people, including our enemies -- even Osama Bin Laden. In light of God's servant love toward us, we must be willing to wash Osama's feet -- and pray for his forgiveness. "...love your enemies, do good to them, and lend to them without expecting to get anything back. (How important is this? Read this next sentence carefully). Then your reward will be great, and you will be children of the Most High, because he is kind to the ungrateful and wicked. Be merciful, just as your Father is merciful." (Lk 6: 27-29; 35-36). When we act like our kind Father, we reflect the fact that we are his children. In Christ, God's been kind to Osama. May we who are his children do the same. May we be encouraged by the above picture rather than offended by it. May we pray, "Father, forgive Osama. He doesn't know what he's doing." P.S. In case some of the faces on the poster are unfamiliar to you, they are (left to right) German Chancellor Angela Merkel; Tony Blair, England; Kofi A. Annan, UN; Osama bin Laden; George Bush; Indian Prime Minister Manmohan Singh; and Jiang Zemin, former president of China.